The Undead Series makes its debut this week with a free show (after you’ve first purchased drinks downstairs) at what’s increasingly looking to be the new venue du jour for local indie acts, Palate Palette. With a line-up that includes punk veterans like Pusher, The Garrison, one of our indie favourites The Fridays, up and coming post punks Swampy Zombie Fever and a rare live appearance by The Maharajah Commission, this looks like a no-fail proposition to us. 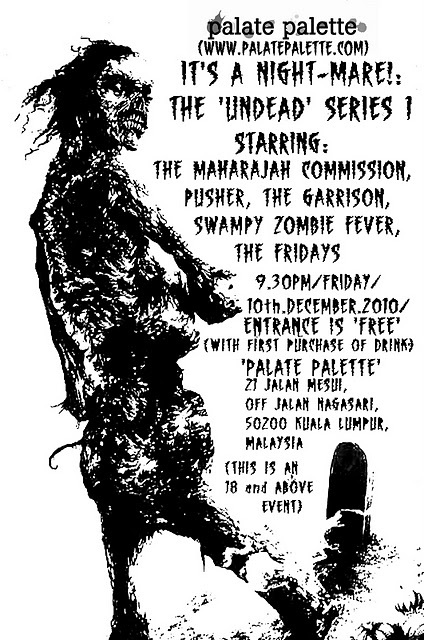 Show starts at 9.30pm on Friday, 10th December 2010 at Palate Palette, 21 Jalan Mesui, Off Jalan Nagasari, Kuala Lumpur. Entrance is free after you’ve purchased your first drink downstairs. Check out the event’s Facebook page as well.